Brainy Athena has never fit in at Triton School, but who would've guessed that's because she's actually a goddess? Zeus's daughter, to be exact. So when she's summoned to Mount Olympus Academy, Athena thinks that she might fit in for the first time in her life. But school on Mount Olympus is not that different from down on earth. Will Athena be able to deal with Medusa, the baddest mean girl in history? 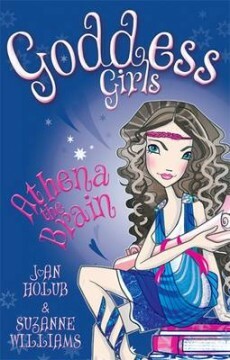 A brand new tween series following the adventures of goddess girls-in-training Athena, Persephone. Aphrodite and Artemis at Mount Olympus Academy. Goddess Girls is a wonderful take on the story of the Greek gods and goddesses! The story kind of reminds me of Harry Potter - a girl finds out she is a Goddess and is whisked away to a magical boarding school. I love how all of the well known Greek gods and goddesses go to the same school (Mount Olympus Academy) - it's fascinating to think about how Medusa, Poseidon and Aphrodite might have acted when they were younger. The characters are well developed and likable (except Medusa and her sisters, of course!). My favourite characters except Athena, the main character, are Pallas - Athena's mortal friend - and Aphrodite. When Athena left to attend Mount Olympus Academy, I felt sorry for Pallas as she had lived with Athena for her whole life and they must have been like sisters. I liked Aphrodite because she looked after Athena when she started her new school. The best thing about this book is that the authors have mixed old myths with modern times. For example, Athena and her friends try out for the Mount Olympus cheer leading squad, and the goddesses love fashion and music just like most of the teen majority these days. Brilliant review! Ooh, I think I know a girl who'd love this one... Thanks!